Ribera: Art of Violence is the first show of work in the UK by the Spanish Baroque painter, draughtsman and printmaker, Jusepe de Ribera (1591–1652), and includes four significant large-scale paintings, plus numerous drawings and other works. If you know anything of the Dulwich Picture Gallery’s significant permanent collection (not all of which is at any one time on view), you might be as surprised as I was, half way through the Ribera exhibition, where the parallel permanent collection rooms are glimpsed through a doorway, to find that one’s opinion of the latter works are strangely recast, as if all have been slighted, changed into second-rate and timid mannerisms. This cuts across expectations and is an odd and unnerving experience. Ribera, of course, has wrung these changes to one’s perceptions by the compelling brute-force of his extraordinary vision. I’ve never seen anything quite like it, not even in the works of Caravaggio, whose outstanding realism was instrumental to the development of Ribera’s mature style. 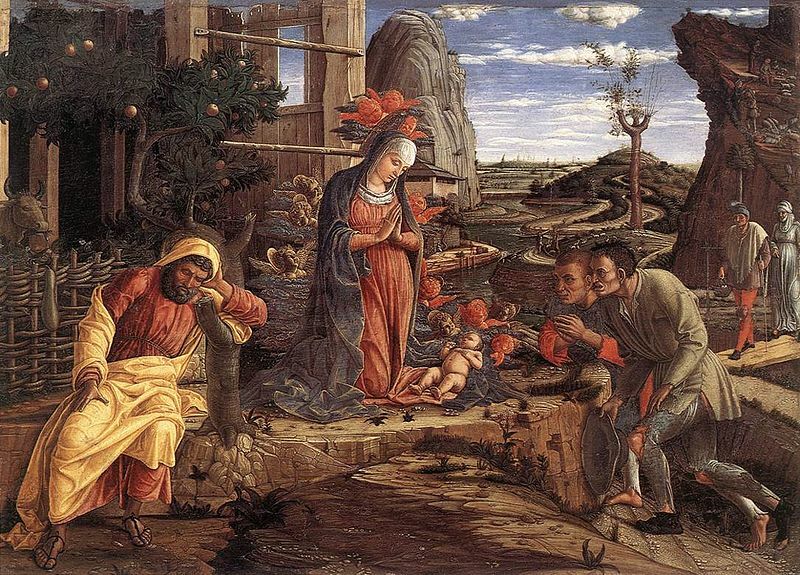 Maybe in the history of art only Tintoretto exceeds him in the lavishness of his imagination. As to whether you can truly like these paintings, or stomach the subject-matter, each must judge accord to their own sensitivity; a more interesting question for me, concerning the inventiveness of his painterly organisations, is whether there is mileage in what at first seems a rather bizarre comparison with recent abstract art. Personally, I find such an evaluation hard to make, hard to take, yet difficult to resist, and ultimately exciting in its threat to what we call modern. I found it took time to get to appreciate Caravaggio, possibly because of my original and continuing distaste for the National Gallery’s rather faked-up “Supper at Emmaus”. 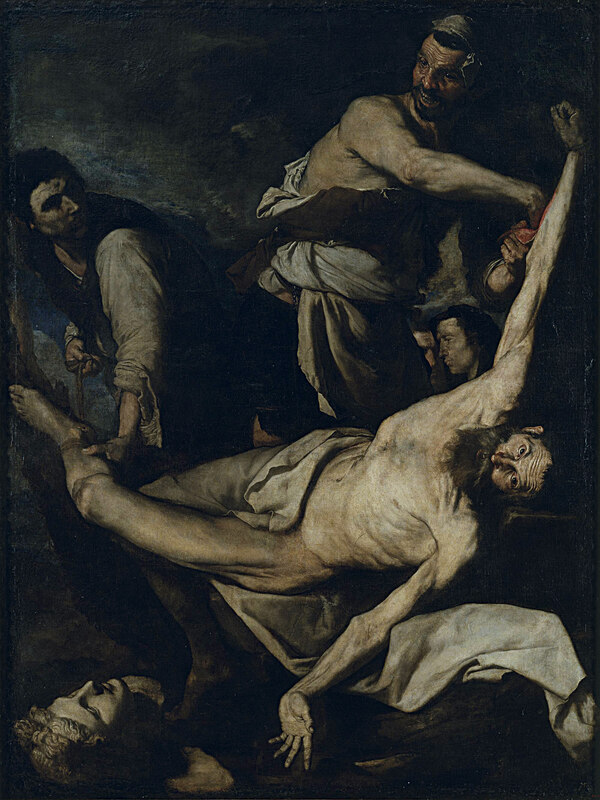 But a few years ago an unlooked-for encounter with his “Christ at the Column” in Rouen (https://www.wikidata.org/wiki/Q931837#/media/File:Caravaggio_flagellation.jpg) made a big impact on me and opened the door a little more to other Baroque painters like Ribera. He is perhaps an acquired taste. For example, it’s a lot easier to find a connection to modern art in the colour of the painterly Venetians rather than in the more severe tonalities and chiaroscuros of Rome and southern Italy (or in Ribera’s case, that of an adopted Spaniard). Colour is the overriding touchstone of modernism, as first taken to heart by Bellini and Titian. But in Ribera’s “Martyrdom of Saint Bartholomew” of 1644, the later of the two excellent works on the same subject now at Dulwich, there exists such a strong oppositional challenge to the formulaic and formalist approaches of so much abstract art, including the exclusivity of systems of colour harmony, that I find myself fascinated by such a brazen assault on the normal architectures of composition. Many will disagree perhaps, but I don’t find the drama of this work the least bit theatrical. 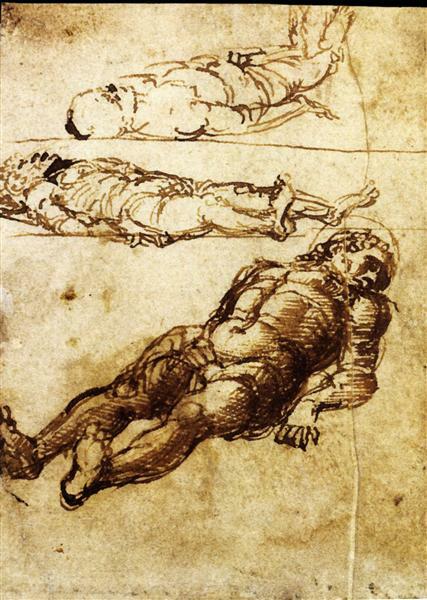 How the bodies interact and articulate in relation to the rectangle, particularly the outlandish and extreme provocations and deportments inflicted on the main figure and the fully-comprehended spatiality of, especially, his torso and head, with the face turned finally forwards towards the viewer, at a sharp angle to the heaving chest, and the only part of the work in direct accord with anything approaching a picture-plane, is surely as challenging and compelling as one might care to find in the art of Caravaggio or anyone else. It has the virtue, too, of entirely excluding the more uncalled-for glib effects of paint, or its more induced and unwarranted sentiments such as one might find – certainly by any direct comparisons in Dulwich – with Rembrandt’s “Portrait of a Young Man”. I do, of course, often love Rembrandt’s draftsmanship for its own sake; and Ribera’s too, and there are quite a few very good drawings by him in this show, some of which would rank with the greatness of Goya at his most harrowing. In the “Inquisition Scene”, late 1630’s (shown at the top of the essay), the tortured criminal finds in his private hell a moment, like Saint Bartholomew, to turn directly to us, the viewer, in an anguish of human engagement that must yet be the envy even now of any abstract artist not so immune to humanity. Perhaps we might have our own moments of a different order, us abstract painters and sculptors, but we should never judge such greatness from the past as finished or redundant. What a little masterpiece that is. I feel both with Mantegna and Ribera a potent link with art now, if we could but unlock that connection a little better. Both these painters make art of such compelling human content that it challenges many things we might assume about the making of abstract art and the scaled-down narrative of its backstory – except, that is, its necessity to be made anew. If we assume that abstract art is different from, and has no need of relations and comparisons with, the greatness of past figurative art, we diminish the possibilities and close down the options of what, in our own present-day context, we are capable of re-inventing as essentially human. ← #106. Robin Greenwood writes on Albert Frey, the Seductions of Mid-Century Desert Modernism and the Disambiguation of Sculptural Spaces. Alan Gouk is no longer adding articles or even comments to Abcrit since we last disagreed, but he has told me to my face that my thoughts about Ribera in this article are profoundly wrong and that this sort of painting has no bearing or connection whatsoever with anything to do with new abstract painting and the preoccupation with colour – as exemplified of course by Alan’s own work. Maybe he is right, maybe he is wrong, but I profoundly love this painting and continue to be amazed at its contrast with so much of the other works in the Dulwich collection. Not only am I unrepentant for the claims I make about this work, but I think more than ever that abstract painting has so much to learn from such great figurative painting without in any way emulating it. Time will tell. What is of interest to me right now is that the problems that even Ribera had with figurative composition – in this case, for example, the rather manufactured inclusion of the head of the statue in the bottom left corner of “Martyrdom of Saint Bartholomew”, which in my opinion upsets the natural and powerful organisation of the whole, is exactly the kind of difficulty that abstract art to date has not been able to address properly – when, that is, it wasn’t doing out-and-out geometry or patterned formatting. What I mean by this is the inclusion in paintings of fake additions to the composition, of backgrounds and infill areas etc. that do not fully participate in the content of the work and are often adjuncts to the main business. Sometimes the great figurative artists get around this, sometimes they don’t. Even the great Rembrandt falls foul of it occasionally, and it’s easier to see when comparisons are drawn with something better. We are at last tentatively seeing a way out of those compositional shortcomings in new abstract art (see Brancaster Chronicles https://branchron.com/), but we have a way to go and much to learn, and the further we go, the more that the genuine human content of great and free figurative art will align itself with our own endeavours. Isn’t this more or less the argument of Frank Stella’s Working Space? Opposites attract, did you say? Yuck, no!